Our last evening in Venice was an interesting one. As usual, we had come into the city by ferry, and now had to make certain that we would catch the last ferry back to Punta Sabioni at 10 PM, which seemed no hardship. We spent the day walking around and gaping at the various sights of canals, gondolas, beautiful churches, and reading commemorative markers about where famous poets had lived. 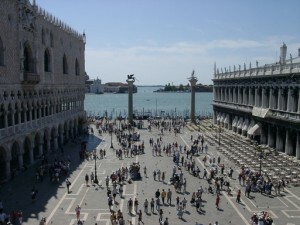 Although much is made of the canals, and deservedly so, Venice is a wonderful city for walking. By supper time, we were exhausted, and found rest and shade in a lovely restaurant on a side street where we ordered a delicious supper. At the next table, sat a young couple. The man had obviously had a bit too much to drink, and kept trying to engage us in conversation, while the young woman sat demurely by without saying a word. Eventually it became impossible to avoid a conversation without being rude, and as the young man wasn’t really being nasty we began talking across our respective tables while eating, and it became a rather interesting conversation. The young man, who it turned out was an Irish TV producer, introduced himself as John R. and the young woman was Elizabeth.. He seemed exceedingly proud of the fact that Elizabeth was three months pregnant. As we talked some more, it turned out that he was not the prospective father, as Elizabeth (who still sat there quietly and was an odd match for her voluble companion), was not his wife, but the wife an American real estate magnate in Boston. Each summer, for several years, John and Elizabeth had met in various resort towns of Europe and spent several weeks together traveling from the Riviera to the coastal towns of Italy. Being American, I was interested in how her husband felt about this arrangement, but it appeared that the gentleman was not informed of whom she was traveling with, being told only that she was with a girlfriend. I had seen Same Time Next Year, a movie with Alan Alda, about a situation like this, but I really didn’t think such things actually happened in real life. Of course, it wasn’t all a one way conversation, although John did most of the talking. He was interested in us, what we did professionally, the fact that we were Jewish, and that we were in Italy celebrating our 25th wedding anniversary. By this time it was getting late, and Linda and I were eager to get out of the restaurant to make it to our ferry by 10 o’clock, but it was difficult getting away from the voluble John. Finally, we said goodbye, paid our bill and made it to the outside. No sooner were we outside than I heard John’s voice calling me, and there they were, John and quiet Elizabeth, in the dark street of Venice, still talking up a stream while we urgently tried to get away. And then it happened. John began to sing to us. What he sang for us was totally unexpected. He sang A Yiddishe Mamme. If you are Catholic, Protestant, Muslim, Bahai, Zoroastrian, Hindu, Taoist or of any other persuasion but Jewish, you probably have never heard about this song. It is universally known and loved among Jews, a treacly composition about how wonderful it is to have a Jewish mother and how sad it is when she is no longer around. To say that I was surprised by this Irishman singing this particular song to us on a street in Venice, is but to put it mildly. I was flabbergasted! After John had finished his song, we said goodbye again, and separated, they in one direction, Linda and I in another. We missed our ferry that night. Having missed out boat, Linda and I decided to take an expensive-but-fun water taxi somewhat later. We now had some time to kill, and around midnight wandered over to Piazza San Marco, where we noticed a small crowd gathered in the middle of the Piazza, some standing, others sitting on chairs they had pulled out from some of the closed nearby restaurant. We walked over to find out what was happening, and saw John and Elizabeth at the center of the group. As usual, Elizabeth was just quietly sitting there. 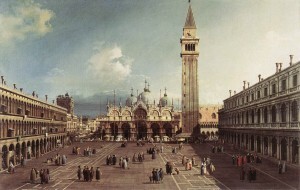 John, in the middle of Piazza San Marco, was teaching the gathered Italians, When I’m Sixty Four. We left them there, hopped a water taxi, and returned to Punta Sabioni.